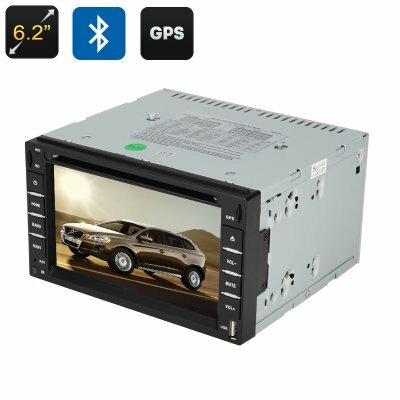 Successfully Added Touch Screen GPS Car DVD Player - 6.2 Inch Screen, 2 DIN, 3D Interface, FM Radio, Bluetooth, Windows CE 6.0, GPS to your Shopping Cart. Get a complete entertainment, navigation and communication system for your car with this 2DIN car DVD player and GPS system. Equipped with a highly accurate porcelain GPS antenna and fast Bluetooth connectivity for hooking up with other devices, the DVD player offers much more than most models on the market. The 2 DIN DVD player comes with a 6.2 inch touch screen display and will offer your passengers great on-the-road entertainment. So, get your DVD collection ready and watch your favourite movies and TV shows while on the road. With a variety of video, audio and image formats supported – you can watch anything you want right from the backseat of your car. The DVD player is also region-free – giving you access to great content from any part of the globe. In addition to giving you a cool way to entertain your passengers on a lengthy car ride, the DVD player functions as a top-notch navigation system. Sporting a highly-accurate porcelain GPS antenna, it will give you correct and clear directions to your destination on its large high definition display. Picking up calls on the road is never convenient. The 2 DIN DVD player comes with fast Bluetooth connectivity – giving you access to even more functionality. Pair the DVD player with your smartphone, and you will be able to use the touch screen interface for picking up calls and holding conversations handsfree. You will also be able to control your music player and adjust the volume using the touch screen. The DVD player supports SD cards of up to 32GB and brings you the intuitive Windows CE 6.0 operating system. The Touch Screen GPS Car DVD Player comes with a 12 months warranty. Brought to you by the leader in electronic devices as well as wholesale car GPS..